Katana (warning: turn down your speakers because their retarded site automatically plays loud bass) in West Hollywood is about as trendy as you can get for Japanese food. Yet, to my surprise, when I was sent their DineLA Restaurant Week menu for a possible dinner, I saw only one sushi option. With this in mind, I thought that perhaps the $34 fixed price would actually be worth it, so off we went to Katana. Showing up last, I was greeted with a rousing “irasshai” (although I was a bit disappointed they didn’t go for the more formal “irasshaimase”) and found that some chicken gyoza (potstickers) had already been ordered. This struck me as strange since we were about to order a fixed price meal, but I decided to roll with it. While waiting for said gyoza, I decided what I wanted for my meal. 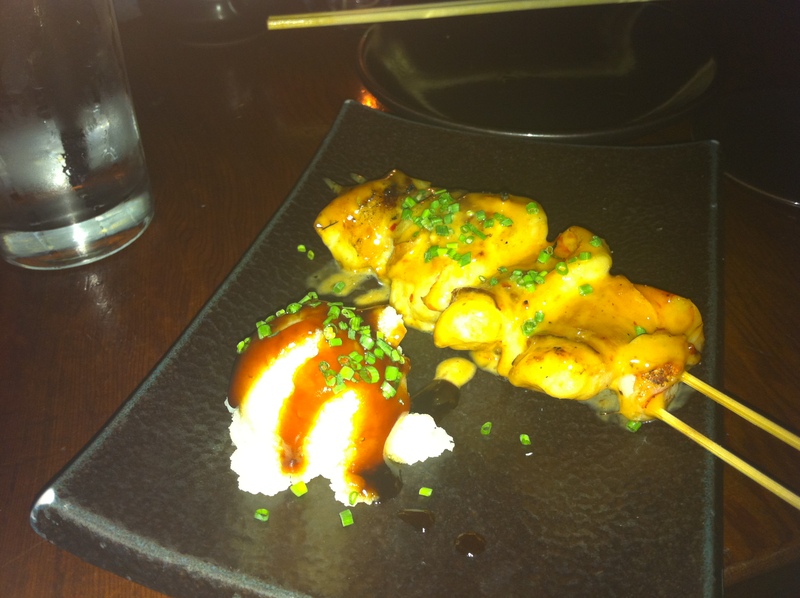 For the appetizer I chose the Ebi Bacon, also known as bacon-wrapped jumbo shrimp with chili garlic sauce. Then I chose the Spicy Niku Don for my main course. 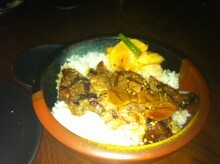 Niku, of course, means meat and in this case the meat was sliced beef and served on steamed rice. 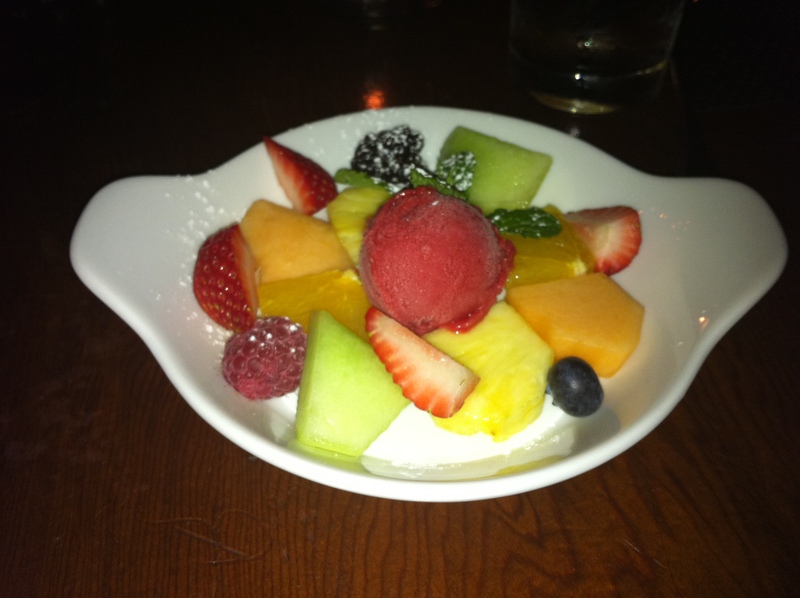 To wrap it all up, I got the sorbet with fresh fruit. Now I was ready to eat some gyoza. When it came out, there were a total of five dumplings. Not exactly what I had hoped for an 11 dollar appetizer. It really was some good gyoza, but I couldn’t help but think about my life once upon a time when I used to stuff myself with a plateful of gyoza for a buck in Hikone, Japan. Alas, such a memory could do me no good at Katana. After that I moved on to my personal appetizer, the Ebi Bacon. If an appetizer is something simply meant to make you hungrier for the main course, then the Ebi Bacon really did its job. 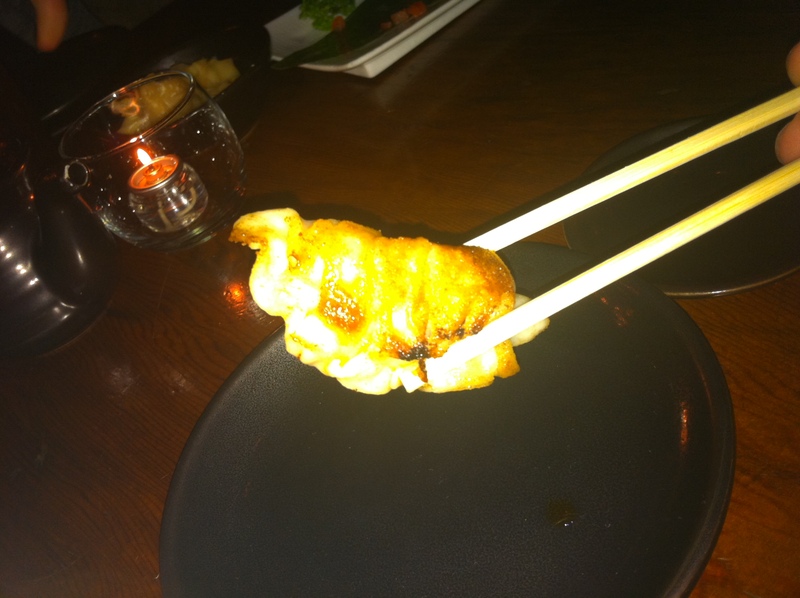 It came as one simple skewer and although there were multiple ebi on the skewer, this was certainly not an appetizer fit for the $34 price range. As for the taste, the Ebi Bacon was really quite delicious. I am often fearful of shrimp because it can be rubbery, but this was nice and crunchy with a nice balance of bacon, chili and garlic. After my skewer I was left wanting more, but there was no more to be found. I know Japan has a lot of Korean influence, but keep it out of my food. Instead, I found my Spicy Niku Don. This dish was pretty much an upscale Yoshinoya beef bowl, but with a vile twist. Yes, that’s kimchi in there. I don’t know what crazy person thought kimchi in niku don was a good idea, but dammit if I wanted kimchi I would’ve gone to a Korean restaurant. And I don’t want kimchi, because it is a terrible terrible pickled vegetable. I removed the kimchi from my don and then went to work. Once again, I was happy with my dish, but I was left wanting more. Preferably more of the beef, because I struggled to maintain a good ratio of beef to rice as I ate through my bowl. Finally, it came down to dessert. First, they brought out the wrong dessert, so I sent it back. After about 15 minutes passed, my sorbet with fresh fruit arrived. I was amazed that such a tiny dish could have taken them so long. Among all the bright colors, I almost couldn’t find the sorbet, but then I realized that it wasn’t because of the bright colors but because the scoop of sorbet was only slightly larger than a raspberry. Wait, I take that back because I have seen raspberries bigger than that. I dug in knowing this would be my final food of the meal and once again I found some tasty food that left me desiring more. Look, we all know the saying, “leave the audience wanting more.” Let me get one thing straight: THIS DOES NOT APPLY TO FOOD. When I leave a restaurant, I want to be full. I may want more another day, but I should never want more immediately after departure and I don’t care how good your food is. You know, unless I just paid a buck. But with Katana, I dropped a lot more than a buck and although I really did enjoy the general taste of the food, there is no way I got my money’s worth.